Wake up early to water the flowers with our decorative set of Antique Galvanized Roosters! Adorable and fun to display in a group or individually! 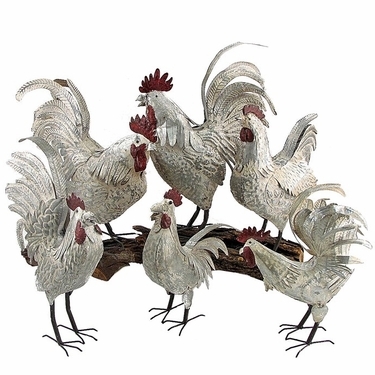 This metal rooster group is perfect for your kitchen or your yard. Each produced with added detail and extra love and careful attention. Each unit has slight variation reflecting the galvanized nature of these beautiful pieces. Wonderful detail and muted tones keep these metal roosters entertaining, but not overbearing. Enjoyable as both an indoor or outdoor decor, place by your plants or in your kitchen for long term display. Assorted sizes: approx 12-15" each.